NVIDIA Quadro K2000/K4000/K5000 has been added too. 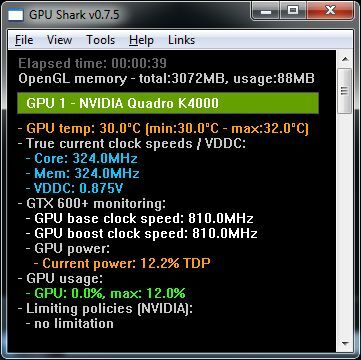 GPU Shark is a simple, lightweight and free GPU monitoring tool, based on ZoomGPU, for GeForce and Radeon based graphics cards and is available for Windows only. GPU Shark offers a global view of all your graphics cards in a single window. More information HERE. added support of GeForce GTX 780 Ti, Radeon R9 290X, R9 290, R9 280X, R9 270X, R7 260X, Quadro K2000, K4000 and K5000. update: ZoomGPU 1.8.21 (with NVAPI R331).